I'm now recalling why I enjoy the desert southwest—the lack of humid heat. We are now traveling from the mountains of Italy and Austria to the Mediterranean coast at Marseilles, France. It's been a whirl wind day of trains to achieve this distance. We started at the train station in Innsbruck, Austria at 8:30am on a trip of nearly four hours back to semi-familiar territory in Zurich, Switzerland. The bonus part of this day was that all 4 train legs of the trip were to be via first class seats on the trains. In Zurich we boarded our second train of the day to Geneva, Switzerland. This was the fanciest train I'd been on yet and at one point we had one of the entire first class coaches all to ourselves. This leg of the trip was 2 hours and 45 minutes. We broke down and bought some very expensive ham sandwiches on this train as well as the most expensive can of coke ever imaginable-- 4.80 CHF! Highway robbery. At the Geneva train station we had close to an hour and a half to wait for our next train to Lyon, France. I managed to connect to a free and unsecured wi-fi connection there to get caught up on email and chat with the Beist for a bit via gmail chat. All sounds well back at home if not a bit rainy. Here, while waiting in the Geneva train station I really started to notice the heat. It doesn't help matters that I'm wearing the same “travel shirt” that I've worn for at least 6 days of this trip without a wash. It'll be in dire need of a wash after today's wearing, though! Once we got on the train at the Geneva station headed for Lyon, France, the first class section was completely full but we were able to find standard seats next to each other. I'm not all bothered, regarding comfort, to sit in th standard fare area but I am quite a bit disappointed in that we paid for upgraded seats and did not get what we paid for. Such are the trains here it seems. Often times you pay for your entry on the ticket but must pay an additional fee to guarantee a seat. The train to Lyon started a bit late and got delayed for a few minutes on en route leaving us with an extremely tight transfer time of 7 minutes in Lyon to exit the train, get our bearings, find out which gate we needed to head to for our next train to Marseilles and get there. This task was made more difficult by the fact that we each have a decent sized duffel bag full of climbing gear with mine weighing at least sixty pounds. Not so nimble nor discreet. We when exited the train in Lyon the first thing I noticed was the heat. Second, I noted the huge crowd. It seems at least two different trains had just dropped their load of passengers off simultaneously on the same platform. We got to moving and both looking around as if we were on that show “The Great Race” but without the fame and fortune or nearly the same drama. Not-so-long story short, we made it with a couple minutes to spare and boy is this is a train! It's the train known as the TGV which is an abbreviation for something in French that translates roughly to “super fast train that doesn't stop much, if at all, along the way.” And the seating in first class is super comfortable complete with a desk and tiny desk lamp allowing me to type comfortably on this here laptop as I watch out the window the late-day light illuminate the whirring French countryside. We'll very soon be arriving in Marseilles and are staying at the Holiday Inn there. It looks as though it's a 5km distance from the train station to the hotel so we may be up for a decent walk with heavy packs or perhaps we'll try our broken French to catch a taxi instead. I just know that I very much look forward to a shower this evening. And, looking further ahead, the dry desert heat of the American southwest. I do miss it along with my family and friends there. Back to the city, Innsbruck that is. But just for a short bit. Tomorrow morning we leave for a full day of trains from Innsbruck to Zurich to Geneva to Lyon to Marseille, France where we'll spend the night and then drive to our friend Rick's house north of Marseille. Since I last updated the blog here Allison and I got to do some more climbing on Falzarego Pass as well as experience a very fun via ferrata (Lipella) that included an 800m tunnel and some fun, exposed climbing near some waterfalls. We also spent a couple nights in rifugios in the Rosengarten group of the Dolomites to climb routes on the three Vajolet Towers. One Vajolet Tower, Delago Tower, was a primary reason we opted to come to to the Dolomites and it was all we had hoped for! I've posted some new photo albums at http://picasaweb.google.com/halladay of the days' action. The time we spent in the Dolomites was fantastic. The views often breathtaking, the people extremely friendly and the climbing full of history and very fun. It is with some sadness that I leave that area of Italy but I now have a good feeling for the Dolomites and fully intend to return. They're that great! We're back in Cortina tonight at the familiar Hotel Impero. It's a great little hotel that is centrally located, has fast wi-fi and the staff are great! Yesterday Allison and I climbed a fun 8-pitch route called "Mariakante" on the Pordoispitze and spent the afternoon hiking around Sella Pass. The whole day was beautiful but as we went to sleep in our hotel in Canzei last night, a thunderstorm raged through for a few hours yet made way for a beautiful day today. So today we slept in, ate breakfast at the hotel and then drove over Sella Pass to Gardner Pass. Just over Gardner Pass we parked and went up for a fun day on the Via Ferrata Brigata Tridentina. It was our first via ferrata experience and one that we really enjoyed. The day's weather was fantastic and the climb experience great. 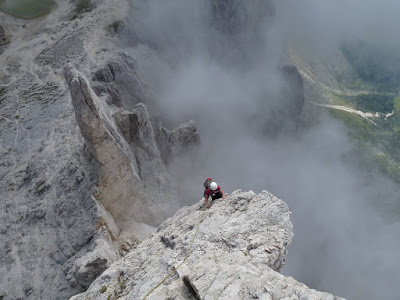 It's awesome that so many people, families included, get out on these via ferrata adventures! 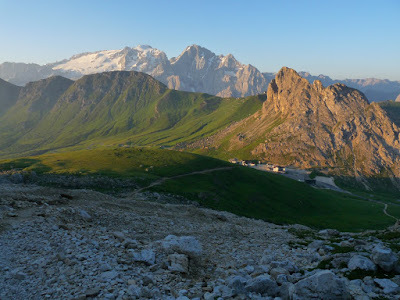 Tomorrow we plan to climb on th Falzarego Towers near Falzarego Pass and maybe squeeze in another via ferrata before driving to Canazei again to stay the night in the Rifugio Gardeccia tomorrow night. Monday night will have us in the Rifugio Alberto near the Vajolet Towers before we drive back to Innsbruck on Tuesday afternoon. It may be a while before we're back online after tonight, though. Thanks for reading! Thursday...it hasn't even been a week since we left Los Alamos and it feels like we've seen and done a fair bit. This is awesome. This evening we're in Canazei, Italy for the next two nights. We've climbed in the Dolomites the past few days and it's been amazing. Beautiful weather and a truly mind-boggling amount of rock. It's everywhere! After spending a couple days in Zurich, Switzerland and a day in Innsbruck, Austria I was way burned out on the cities and was super stoked to get outside in the Dolomites on Tuesday. Yesterday we were skunked on the big 14 pitch route we wanted to climb (three slow moving parties ahead of us forced me to downclimb the first pitch and tuck my tail between my legs.) We then went to climb a 6 pitch easy route and found it completely choked up with groups and none of them appeared to be moving at all! So we did a shorter 3 pitch route, super easy, to a cool summit. We got up early this morning and was the first party on that 14 pitch, 5.7, route (south arete of Tofana di Rozes) and it was awesome. And the cool thing is, the weather today was quite a bit better than yesterday so we felt avenged. We'll be climbing around here the next couple of days before heading back to Cortina for a night and then to Rifugio Alberto for two nights to climb in the Vajolet Towers area hopefully. I'm not a fan of cities. I can appreciate city life and function for a short bit but I was at the end of my appreciation by the time we left Innsbruck, Austria this morning. The crowds, the heavy European smoking, the noise and the traffic. It was nice to see all that in the rear view mirror this morning when we picked up our rental car in Innsbruck and drove the 2.5 hours to Cortina de Ampezza, Italy. And now we're very happy. This quaint mountain town is still pretty big in size but it's situated high in the Dolomites and feels full of life. I can't quite put my finger on it but everything about this area feels so much more friendly and appropriate than either Zurich or Innsbruck. We checked into our hotel, Hotel Impero, and pretty much made a beeline for the Cinque Torri area to get some climbing in. This area is at about 7,400 feet and easily accessible via a five minute ski lift ride and a 10 minute approach hike. 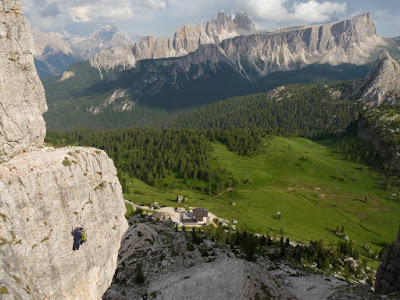 It gave us a good opportunity to get warmed up to the limestone of the Dolomites. All the hillsides in the area are a very lush green and rock simply juts out of the hillsides making for some very dramatic mountains. 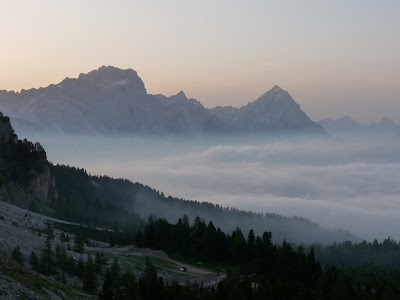 We plan to spend the next six days around here in the Dolomites with a night or two in a rifugio but most likely mainly doing day trips from hotels in Cortina and/or Canazei. Boy, we were tired. And, thankfully, our room was very dark. We slept off a major chunk of the jet lag this morning sleeping in until 7:30am. Once we got moving we headed downstairs to the restaurant in the lobby where our included breakfast was served. This was no American continental breakfast either. Bacon, eggs, sausage, fresh bread, fruit, yogurt and a pile of oranges and a juicer to make your own fresh-squeezed orange juice. Awesome! No doubt I over ate a bit but we weren't planning on a lunch so I was just being cautious. It was an overcast and windy morning so we packed our jackets and umbrellas in the backpack and hit the streets. First stop was the Schweizeriches Landemuseum near the train station. For 10 CHF each we enjoyed a bit of natural history swiss-style and then attempted to understand the all-German Swiss history exhibition which was very nicely done but impossible to understand. From there we caught the train to Uetliberg, a decent foothill with a footpath to the summit and viewing tower at the top. This area boasts what are likely the closest trails for running and hiking and we enviously waved at a number of trail runners out there. Also, along the trail is a mini-scale map of the planets one can follow for nearly 8km along the ridgecrest to the Adliswil tram down. We hiked that trail for close to two hours as the day got better and better. It even ended up a bit warm at time. We caught the bus/tram back to city center and went in search of good chocolate at a shop called Teuscher recommended by Brian Crone's wife. The first one we found at 4:07pm closed at 4:00pm. So we hopped on the tram down to Bellevue where another one was supposed to be. Whilst down there we figured we ought to check out the Kunsthaus modern art museum but found it cost 23 CHF each and was only open for another 30 minutes so we bailed on that. Instead, we rented a paddle boat for 18CHF for 30 minutes and paddled across Lake Zurich and back dodging the big tourist boats along the way. It was odd when I rented the boat...the guy barely spoke, took my 18CHF and driver's license and said, "OK, take the orange one for 30 minutes." That was it. No orientation, no forms to fill out, no guidelines. So we hope paddling across the lake between big tourist boats was allowed. When I returned the boat I saw other renters filling out paperwork and getting the rules spoken to them. We did find the Teuscher in the Felix Cafe after that and scored four truffles. Tasty! After dessert we went in search of dinner. Casa Mia was another Italian place that came recommended but we found it closed. Naturally I gravitated towards beer and we popped into the Brasserie Federal which claims to have more that 100 Swiss beers. Problem was, the menu had no English on it and our question to the waitress, "Sprechen Sie Deutsch?" was met with the stern answer, "No!" and she walked away. OK, time to move on to that little Italian place we passed on our walk towards our hotel. I don't recall the name but it was a tasty and quite enjoyable. Tomorrow we hit the rails with a 9:40am train to Innsbruck, Austria. We should get there around 1:30pm and will be staying at the Hotel Goldene Krone for one night before renting a car and driving south down into the Dolomites of Italy. While it's been fun exploring the city life a bit and gettin' cultured, I feel much more at home away from crowds and up in the mountains so I'm looking forward to getting into Italy. Allison and I hit the skies yesterday for a three-week trip to Switzerland, Austria, Italy and France. 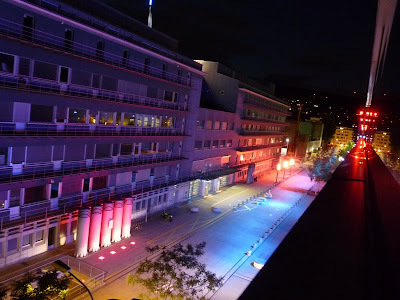 Our first stop finds us in the Hotel Novotel in Zürich, Switzerland where I'm writing this from. 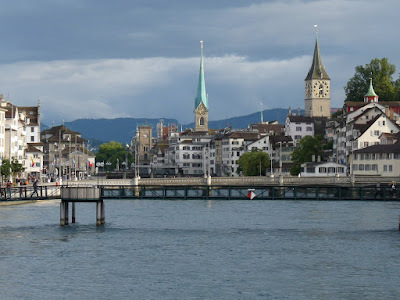 It's the first visit for either of us to Zurich and so far we're really enjoying it despite the fact that neither Allison nor I speak any German--the predominant language here. 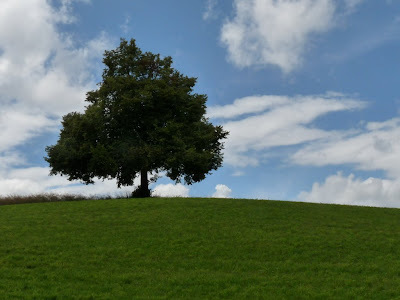 I was impressed with how easy it was to go through customs and be on our own in Zürich. We arrived this morning and purchased 24-hour public transport pass for 12 CHF each which allows us unlimited transport on the city trains, buses and trams. It took us a little bit of time to figure out which train to take from the airport to the main station. This wasn't too bad at all except for the fact that I was schlepping around our big North Face duffel bag with our climbing equipment (to be later used in the Dolomites) and it was a bit uncomfortable. A short 10 minute walk from the main station got us to our hotel where they were able to let us check in early (we arrived in Zürich at 7:15am and were at the hotel by 8:15am). After checking in we got out for a short bit to take the tram downtown to visit a couple of the more famous churches in the area. The Fraumünster church has some amazing stained glass by Marc Chagall which I could appreciate. We then found ourselves very tired (we had been up all night on the flight) so we wandered back to the hotel to nap for a few hours. In the evening we went exploring downtown again and ate dinner at an Italian place. A quick stop at the Coop grocery store for snacks and we were back at the hotel ready for bed. Tomorrow we plan to go visit the zoo, hike at Uetliberg and a couple of the museums before leaving for Innsbruck the following day. The view from our hotel room at night.